The Mora Robust is a great knife made by Mora of Sweden, it is very similar in looks to the Mora Companion knife but has a thicker blade and is heavier. As its name suggests it is a robust knife that has been developed for and in collaboration with demanding professional sectors. The scabbard features a mount button on the front for adding a second Mora scabbard to be clipped on using the button, thus enabling the wearing of knife pairs. The handle has a patterned high-friction grip and is ergonomically designed to facilitate work and prevent work-related and repetitive strain injuries. The blade is made of high quality carbon steel and is 105mm long and 3.2mm wide. 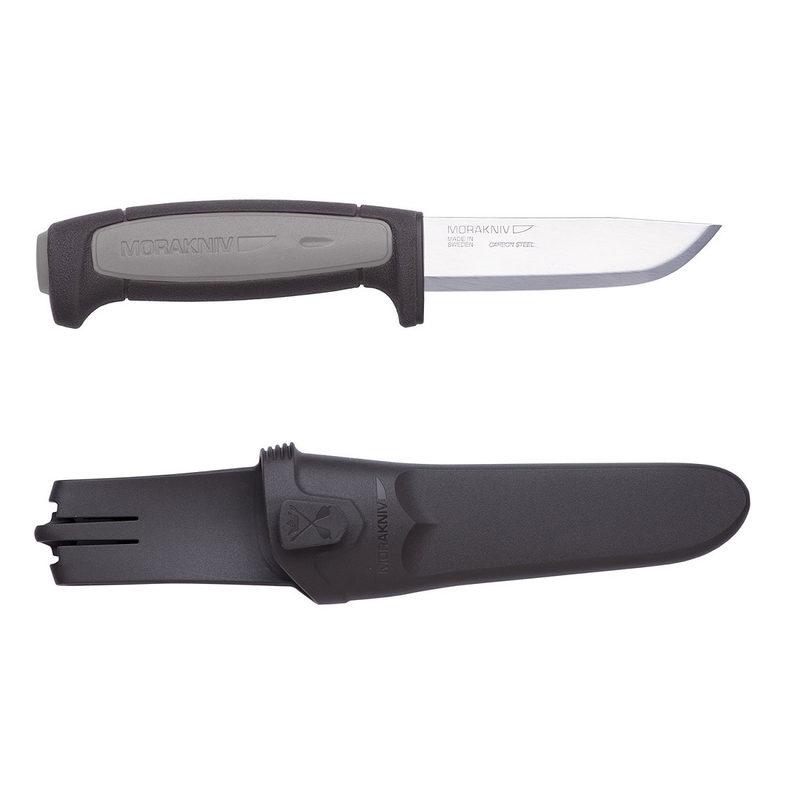 Comes supplied with a grey plastic sheath. It is illegal to supply a knife to anyone under the age of 18. Woodland Ways actively checks the details of all orders for knives, and other edged items. Should we be unable to confirm your eligibility, you will be asked to provide proof of age in the form of a photocopy of your drivers licence or passport. Arrived very quickly. No had a chance to use the knife yet but it looks grest, especially considering the price. The handle feels good to hold and is slightly rubberised so it feels secure in the grip. I wasn't expecting much from the sheath. It looks like a basic plastic cover in the pictures and was going to buy another leather one. However the sheath is much beeter than I expected. The knife clicks into it so would be nice and secure. There is a belt clip and a toggle on the front which is presumably to tie something like a spark stick to. I'm looking forward to using it on my next trip to the woods. The latest addition to our adventure kit which will live safely locked away with the hatchet in the kitbox until needed. I've not had a chance to properly use it yet but it feels very 'robust' indeed â the blade is 3mm thick and seriously sharp! Great quality feel and excellent value for the money. Good, quick delivery, thank you. I haven'the used the product yet as I am waiting until my bushcraft course with NI Survival.